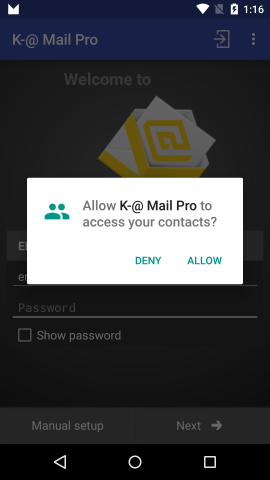 deny (app will work without that permission). If the user checks Never ask again however, the second dialog with the explanation shouldn't be shown, especially if the user already declined once before. Now the question is: how does my app know whether the user has checked the Never ask again? IMO the onRequestPermissionsResult(int requestCode, String permissions, int grantResults) doesn't give me that information. 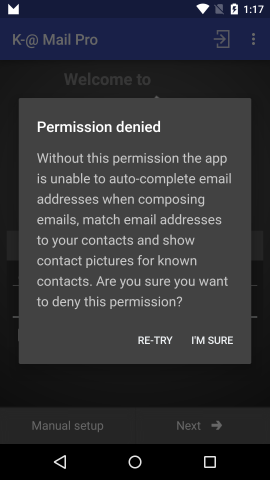 A second question would be: does Google have plans to incorporate a custom message in the permission dialog that would explain why the app needs the permission? That way there would never be a second dialog which would certainly make for a better ux. Developer Preview 2 brings some changes to how permissions are requested by the app (see also http://developer.android.com/preview/support.html#preview2-notes). To help find the situations where you need to provide extra explanation, the system provides the Activity.shouldShowRequestPermissionRationale(String) method. This method returns true if the app has requested this permission previously and the user denied the request. That indicates that you should probably explain to the user why you need the permission. If the user turned down the permission request in the past and chose the Don't ask again option in the permission request system dialog, this method returns false. The method also returns false if the device policy prohibits the app from having that permission. To know if the user denied with "never ask again" you can check again the shouldShowRequestPermissionRationale method in your onRequestPermissionsResult when the user did not grant the permission. // user also CHECKED "never ask again"
// user did NOT check "never ask again"
There is no way of sending the user directly to the Authorization page. You can check shouldShowRequestPermissionRationale() in your onRequestPermissionsResult(). Check whether permission was granted or not in onRequestPermissionsResult(). If not then check shouldShowRequestPermissionRationale(). If this method returns true then show an explanation that why this particular permission is needed. Then depending on user's choice again requestPermissions(). If it returns false then show an error message that permission was not granted and app cannot proceed further or a particular feature is disabled. Apparently, google maps does exactly this for location permission. You can determine it by checking if permission rationale is to be shown inside the onRequestPermissionsResult() callback method. And if you find any permission set to never ask again, you can request users to grant permissions from the settings. My full implementation would be like below. It works for both single or multiple permissions requests. Use the following or directly use my library. //act according to the request code used while requesting the permission(s). What I have noticed is, if we check the shouldShowRequestPermissionRationale() flag in to onRequestPermissionsResult() callback method, it shows only two states. State 1:-Return true:-- Any time user clicks Deny permissions (including the very first time). State 2:-Returns false :- if user selects “never asks again". // now, user has denied permission permanently! // TRUE   FALSE  =  Just been permanently denied --> Changing my caption to "Go to app settings to edit permissions"
I had the same problem and I figured it out. To make life much simpler, I wrote an util class to handle runtime permissions. * Check if version is marshmallow and above. * 1. Below M, runtime permission not needed. In that case onPermissionGranted() would be called. *     If permission is already granted, onPermissionGranted() would be called. * 2. Above M, if the permission is being asked first time onPermissionAsk() would be called. * 4. Above M, if the permission is disabled by device policy or the user checked "Never ask again"
*     check box on previous request permission, onPermissionDisabled() would be called. And the PreferenceUtil methods are as follows. Now, all you need is to use the method * checkPermission* with proper arguments. how does my app know whether the user has checked the "Never ask again"? If user checked Never ask again, you'll get callback on onPermissionDisabled. *    Case 5: User denied the permission and also clicked on the "Never Show again" check box. // This is Case 4. // case 5. Permission denied permanently. // You can open Permission setting's page from here now. I wrote a shorthand for permission request in Android M. This code also handles backwards compatibility to older Android versions. // Do something with your permissions! The method shouldShowRequestPermissionRationale() can be user to check whether the user selected the 'never asked again' option and denied the permission. There's plenty of code examples, so I would rather explain how to use it for such a purpose, because I think its name and its implementation makes this more complicated that it actually is. As explained in Requesting Permissions at Run Time, that method returns true if the option 'never ask again' is visible, false otherwise; so it returns false the very first time a dialog is shown, then from the second time on it returns true, and only if the user deny the permission selecting the option, at that point it returns false again. To detect such a case, either you can detect the sequence false-true-false, or (more simple) you can have a flag which keeps track of the initial time the dialog is shown. After that, that method returns either true or false, where the false will allow you to detect when the option is selected. Try this simple permission library. It will handle all operations related to permission in 3 easy steps. It saved my time. You can finish all permission related work in 15 mins. It can handle Deny, It can handle Never ask again, It can call app settings for permission, It can give a Rational message, It can give a Denial message, It can give a list of accepted permissions, It can give a list of denied permissions and etc. Use of this requires setting a shared preference boolean with the name of your desired permission (e.g. android.Manifest.permission.READ_PHONE_STATE) to true when you first request a permission. Build.VERSION.SDK_INT >= Build.VERSION_CODES.M as some of the code may only be run on API level 23+. ContextCompat.checkSelfPermission(activity, permission) != PackageManager.PERMISSION_GRANTED to check we don't already have the permission. !activity.shouldShowRequestPermissionRationale(permission) to check whether the user has denied the app asking again. Due to quirks of this function, the following line is also required. PreferenceManager.getDefaultSharedPreferences(activity).getBoolean(permission, false) this is used (along with setting the value to true on first permission request) to distinguish between the "Never asked" and "Never ask again" states, as the previous line doesn't return this information. Please don't throw stones at me for this solution. This works but is a bit "hacky". When you call requestPermissions, register the current time. if the result is not granted, check the time again. Since the user did cannot possibly click so fast on the deny button, we know that he selected "never ask again" because the callback is instant. // Case 1. Permission is granted. // Before navigating, I still check one more time the permission for good practice. // Case 2.2. Permission was already denied and the user checked "Never ask again". // Navigate user to settings if he choose to allow this time. private val PREFS_FILENAME = "permission"
private val TAG = "PermissionUtil"
I would like to offer the permission referring functionality initially. If the user uses it and has no rights, he/she gets the either the 1th dialog from above or both the 2nd and 3rd. When the user has chosen 'Never ask again' I would like to disable the functionality and to display it differently. - My action is triggered by a spinner text entry, I would also like to add '(Permission revoked)' to the label text displayed. This shows to the user: 'There is functionality but I cannot use it, due to my permission settings.' However, this does not seem to be possible, as I cannot check whether or not 'Never ask again' has been chosen. I came to a solution I can live with by having my functionality always enabled with an active permission check. I am showing a Toast message in onRequestPermissionsResult() in case of a negative response but only if I have not shown my custom rationale popup. So if the user has chosen 'Never ask again' he gets a toast message only. If the user is reluctant to chose 'never ask again' he gets only the custom rationale and the permission request popup by the operation system but not toast, as three notifications in a row would be too much pain. When the system asks the user to grant a permission, the user has the option of telling the system not to ask for that permission again. In that case, any time an app uses requestPermissions() to ask for that permission again, the system immediately denies the request. The system calls your onRequestPermissionsResult() callback method and passes PERMISSION_DENIED, the same way it would if the user had explicitly rejected your request again. This means that when you call requestPermissions(), you cannot assume that any direct interaction with the user has taken place. I have to implement dynamic permission for camera. Where 3 possible cases occurs: 1. Allow, 2. Denied, 3. Don't ask again. You can use if (ActivityCompat.shouldShowRequestPermissionRationale(this, Manifest.permission.CAMERA) method to detect whether never ask is checked or not. //                            //proceed with logic by disabling the related features or quit the app. Above code will also show dialog, which will redirect user to app settings screen from where he can give permission if had checked never ask again button. Not the answer you're looking for? Browse other questions tagged android android-permissions android-6.0-marshmallow or ask your own question. How Do We Distinguish Never-Asked From Stop-Asking in Android M's Runtime Permissions? Does checking the Never ask again box when asking for a runtime permission disable future dialogs? 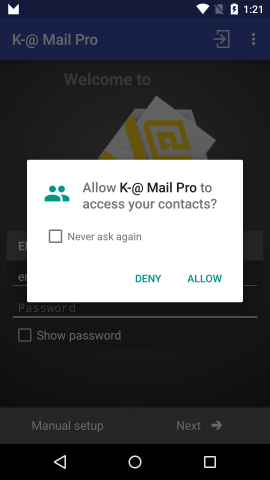 Android M - anyway to know if a user has chosen never to show the grant permissions dialog ever again? How to avoid requestPermission() if the user has checked “Never ask again”?